Lucky Red Casino has acquired a reputable position in the online gambling industry with its exclusive and diversified game titles. It features over 100 authentic casino games that are developed by Realtime Gaming. Expect a variety of slot machines, video poker as well as table games that may be played for fun or real money. Some of the popular titles include Aladdin’s Wishes, Cleopatra’s Gold, Cash Bandits, and Crystal Waters among many others. All the games were created with impressive visuals and graphics and can be played instantly from the browser or mobile app, as well as downloading. When it comes to the welcome bonus, a handsome 400% is offered on slots, and 100% on other games. The casino is operated under BeSoftware NV owned by The Club World Casino Group and is legally authorized by the Curacao Government. Moreover, each game is audited by the Kahnawake Gaming Commission for their fairness and randomness. The payout percentage goes through a monthly audit by independent auditors, probating their accuracy. If you are met with any confusion, you may contact the 24/7 customer support via phone/live chat/email. The customer support phone number is toll-free for callers from the USA. Altogether, Lucky Red Casino ensures all the right measures of security as much as the entertainment. You can access all the Lucky Red Online Casino games at the casino’s own website. The website is concise and definite with ample informative content. There is a detailed FAQ section, the “lobby” at the index page features useful information like the Cashier section and preview of current promotions. A separate web page features the active promotions with details. The Terms & Conditions are in the footer. Most of the games at are available on instant play, mobile and downloading. 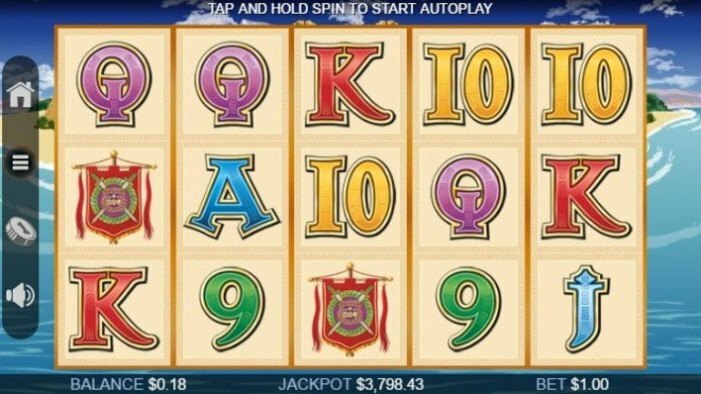 The instant play or “no download” option lets you play at the casino’s website by just signing up. Download option means you can save particular games on your PC, Tablet or Television. The mobile app gives you access to play on various devices with seamless functionality. However, all the choices will require the internet. The game selection is clarified excellently—there are three icons denoting instant play (thunder); mobile (a vertical rectangle) and download (downward pointing arrow). The icons appear at the right bottom of the game title, that’s tiny yet easily seen. To start playing, all you have to do is sign up to play for fun or real money. The age limit to sign up with Lucky Red Casino is minimum 21. At Lucky Red Casino play online some of the exclusive RTG slots, including classic, video, and progressive ones. There is a handful of decent progressive slots, including Spirit of Inca, Megasaur, Jackpot Pinatas, Jackpot Cleopatra’s Gold and Aztec’s Million. If you are looking for something other than slots, you may have the most out of the table games like Roulette, Blackjack, Baccarat and the likes of Suit ‘Em Up Blackjack, Caribbean Stud Poker & Hold ‘Em Poker. You may also enjoy the video poker room with inclusions like All American Poker, the Bonus Poker series, Deuces Wild and many more. Winning the jackpot is wholly random with handsome payouts. 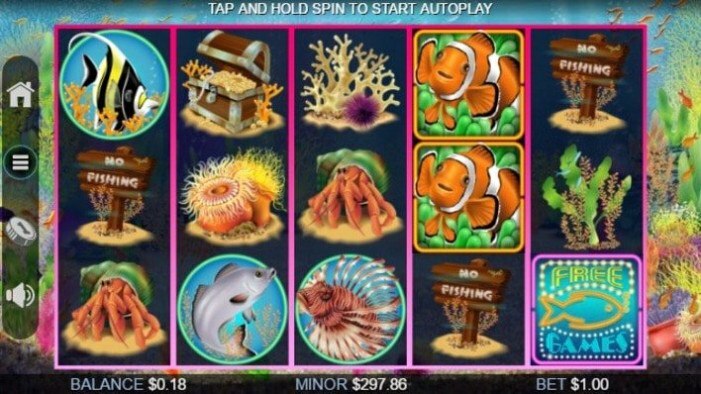 Players are recommended to start with a minimum or moderate deposit at the fixed jackpot slots. Once they get the hook of it, they can wager with greater bankrolls, as per their convenience. A minimum deposit is $35 and the maximum deposit would be $1,000. The first wager is always done with cash, for the second wager one may use bonus chips. 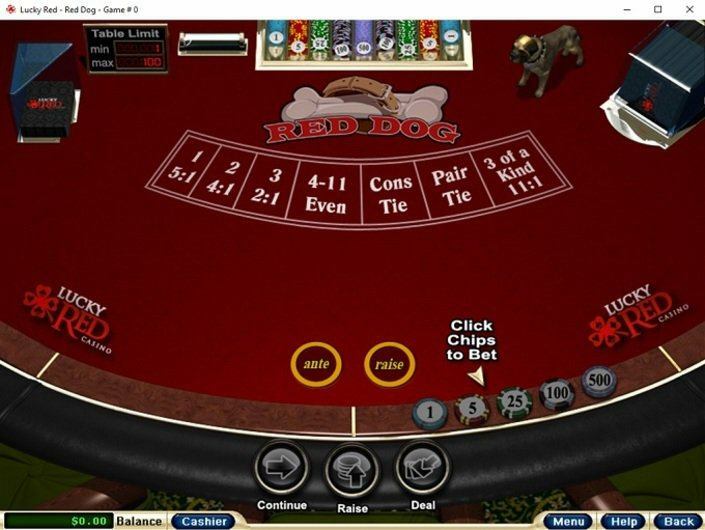 Certain games require the player to place a wager, in order to qualify for any bonus or promotional offer, or cashout their winnings. All non-deposit bonuses have a wagering requirement of 20 times the bonus amount. The wagering requirement changes as per the type of games. Lucky Red Casino is based out of the UK. It is one of the few casinos in the region that cater to the American audience along with many other countries. The accepted currencies here are USD & EUR. Currently, the casino restricts real money wagers from Costa Rica, Netherlands Antilles, Israel, Russian Federation, the UK (inclusive of Northern Ireland, Channel Islands and the Isle of Man), Romania, Hungary, Australia, and France. Moreover, the terms & conditions also state that certain countries may not qualify to receive any match bonuses. These countries are Poland, Belarus, Bulgaria, Ukraine, Philippines and some others. It is always the player’s responsibility to ensure the legality of gambling online from their respective countries. If you are still unsure as to whether these restrictions apply to you, please contact support. 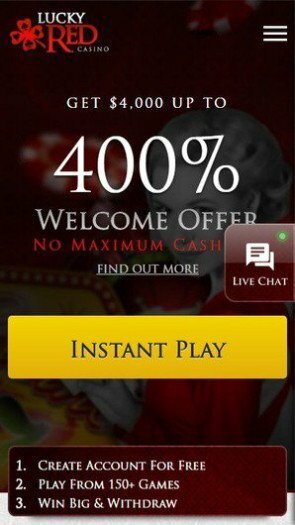 Lucky Red Casino bonus offers a 400% match worth up to $4,000 on your 1st deposit spent on slots, keno and scratch cards. A 100% welcome bonus is offered on first deposits spent on other games than slots. However, cashout is only permissible after wagering 30 times on select casino games. The wagering amounts vary as per the games. Newcomers are not the only beneficiaries of bonuses and rewards. There are many attractive promotional offers available on a daily basis along with comp points and other seasonal offers for long-term players. The wide range of promotions and bonuses are attached with some stringent conditions for payout. To start with, there is only 1 no deposit bonus offered per player. And in order to activate the welcome bonus, you have to enter the bonus code flashed on the website. Each bonus is available only once per IP address, household or business address. Duplicate accounts are strictly monitored and dismissed. Each bonus has discriminated validity for specific wagering requirements on selected games only. And every cashout of bonus wins is attached to the wagering requirement. Withdrawals can only be approved after verification. Sometimes it has to be done within a timeframe like 30 days or so. Lucky Red Casino has standard digital payment options wherein players may deposit using credit and debit card transactions, Bitcoin payments, as well as e-wallets like ECO Cards, Neteller, and Skrill. Bank Transfers and Wire transfers are not accepted for depositing money, but they are available when cashing out your winnings. The payment options are rather streamlined to only the most trusted and widely used in the US. But the payment processing is seamless and timely that does not exceed the given timeframe. The payment takes standard time being secured with SSL Encryption that is certified by Secure Server Certification Authority Verisign. This is the ultimate security technology for online transactions. It ensures complete privacy and protection of financial and personal data. The minimum deposit amount is $35, while the maximum is $1,000. And while the deposits are instantaneous, the withdrawals take time as per the payment method. Moreover, all withdrawals are limited to a maximum $5,000 per week. The withdrawal amount as well as the weekly cash out limit varies as per the payment method you choose. A Lucky Red Casino Review will be incomplete without more specific details about the deposit and withdrawal options. So the table below is used for clarification. A photo or a scanned copy of a Government Issued ID (Driving License or Social Security Card). Photograph or scanned copy of your credit/debit card which you tend to use for making a deposit. Address Proof (Phone bill or Bank statement). Government ID can double up as your identity and age. The phone/electricity bill will verify your current address proof. The financial status proof will require a copy of your credit/debit card as well as a bank statement. This is to verify that the credit card/debit card you are using is yours. Once you have gathered all these materials, send them to the casino’s email address. 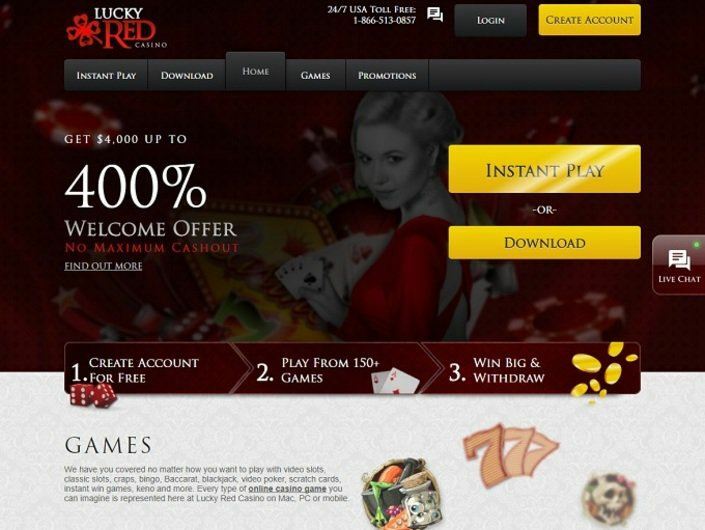 Lucky Red Casino pinpointed the core attributes expected from a reputed online casino, and have stuck to their agenda. They don’t seem to be overly ambitious about number of games and options. Instead, they are passionate about quality games, a clear-cut interface, 24/7 support, and stringent security. While most casinos win by numbers, this casino is certainly a winner of quality. This being the most advantageous factor about Lucky Red, there are many more attributes to count on. 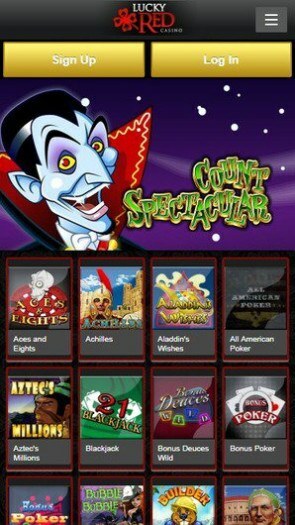 It’s a good thing that Lucky Red Casino offers a selection of decent games and a seamlessly functional user experience. But the best advantage is its flexible cross-platform usability. The fact that you can play from a diverse range of devices, via PCs, Laptops, Tablets, Television and Mobile phones is amazing. This is how customer support should be like. While many top-notch online gambling portals lose out on reliable contact availability, Lucky Red has kept no stones unturned. Users will be able to reach them with any query, anytime. Moreover, all American users are given a free-phone facility. They are very prompt with responses, as well as resolutions. The casino has gone the distance to secure the entire system. Be it the license form Curacao Government, or SSL encrypted payment gateways, or specifically audited games. Everything is prim and proper. The RNG based games are audited every month, by independent auditors like iTech Labs, and Central Dispute System. The average payout percentage is audited once every month, ensuring complete randomness and fairness. Even though there are some acute conditions and 30x wagering requirements to extract the 400% match, it’s well worth it. It is a massive sum to bet on. Moreover, the daily promotional offers are something unique. The number of games might not be so big, with rather a handful of choices with around 80 slots and 20 table games. Despite the limited number of choices, the site offers a sophisticated and elite level gaming experience. Enticing visuals, graphics and sounds, and big wins are distributed in an orderly manner. 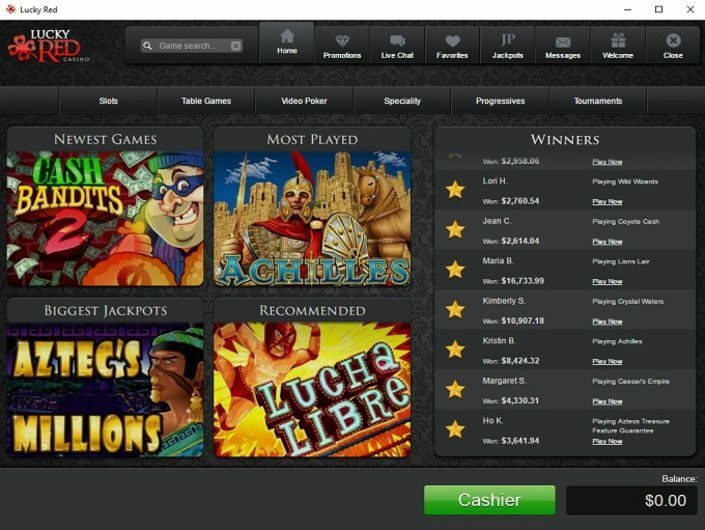 Altogether, this is a definite, clear, and safe online casino that aims to give players the ultimate gaming experience. Signing up with a casino is aided by the awareness you are doing so after reading and wholly understanding the terms & conditions. Fantastic game on the heat of excitement! A decent casino for decent players. Win here more than real! 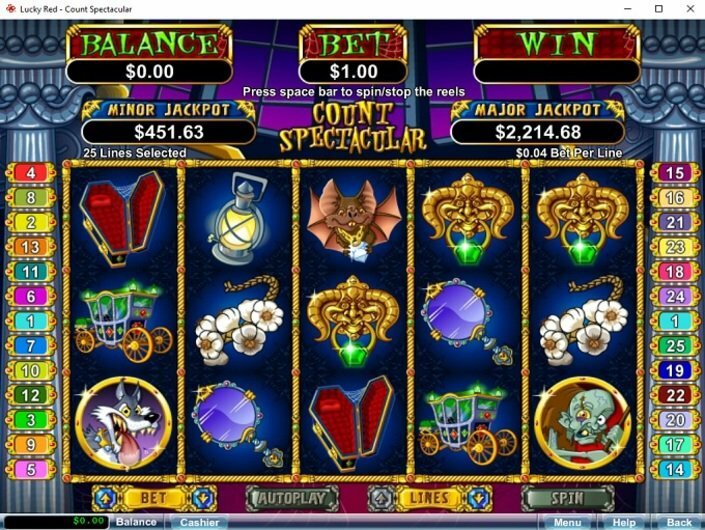 I am satisfied with this casino completely. More excitement and more wins! An honest game that gives every player the chance to try their luck and become rich.Wtf? Why are people afraid to play such an honest casino? A lot of different games. It's in this casino that I receive bonuses on my account for the first deposit. I'd be glad if you add even more payment systems for money entry. With the game Lucky Red Casino is not bored. The main thing is to read the rules and get acquainted with all possible options for winning. If you take this situation seriously, then the game will go to a big splash. There are many bonuses that will help to get closer to the cherished goal, but know the boundaries, so as not to stay with anything. Well, this casino is a nice gameplay with similar rules as in other places. but I really like the fact, that here u can easily play from each device u have and the interface will be always perfect and without any lags or bugs/ ! Plenty of slots! Most of them u can try in demo-mode without investing real money...but frankly speaking it's too boring for me!